Bangus or milkfish is notoriously known for having a lot of fish bones. They are also known to make a lot of splatters when fried. Therefore, for those who love milkfish but not all the thing I mentioned above, this Rellenong Bangus recipe is the perfect one for you! 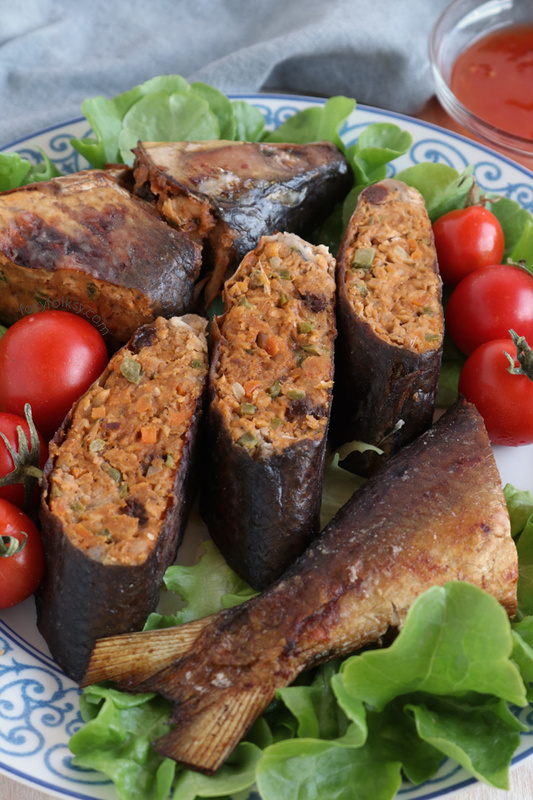 Rellyenong Bangus is a stuffed milkfish, wherein the meat is removed without breaking the skin of the fish and stuffed back after the meat is seasoned and cooked. 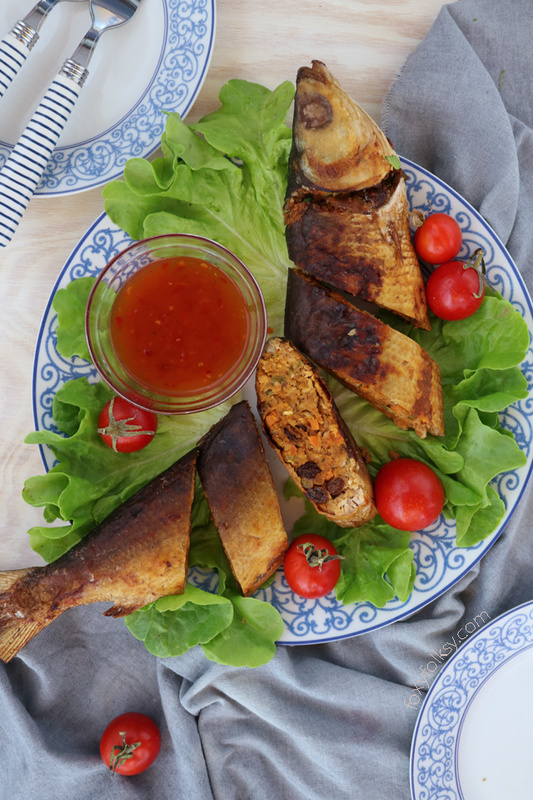 Afterward, the whole milkfish is usually fried to golden crisp. I for one have an aversion to frying milkfish, well to anything that involves frying actually and you can understand that if you notice the big scar on my right hand on my videos. I share this scar with my mama as we were both in same kitchen accident some ancient years ago that involves frying (chicken). But the fear of oil splatters is still there. So, since I hate frying, I baked my Rellenong Bangus instead and I think this will be how it is for me from now on. Not only was it painless it is also more practical since I do not have a frying pan that will fit the whole milkfish in. Warning! The following images contain graphic content! Hehe! Here I am trying my best to illustrate how I removed the fish meat keeping the skin whole and intact. Photo 1 (top, left): Remove scales by using a blunt knife. 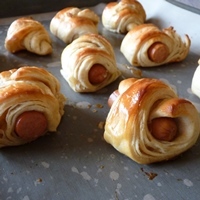 Remove the guts and intestines through the top opening. Remove the gills as well. Wash and pat dry with paper towel. Photo 2 (top, right): Tilt the fish head up, snapping the spine in the process. Break also the bone at the bottom near the tail. Photo 3 (bottom left): Insert a spatula in between the meat and skin through the opening to separate the meat from the skin. Move it up and down and around inside the skin. Don’t worry the skin is tougher than you think and will not break so easily. Photo 4 (bottom, right): If correctly done, the meat should come out when the bone is pulled out from the opening. If not just push the meat out. 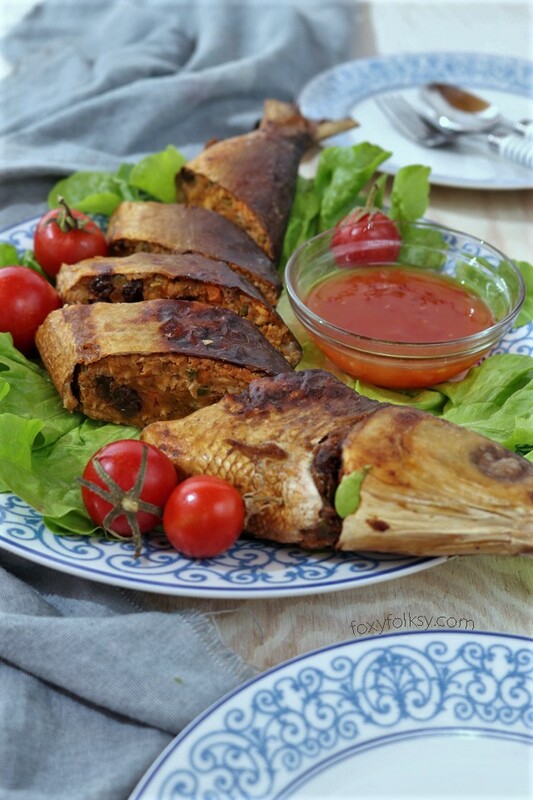 Try this Filipino Stuffed Milkfish or Rellenong Bangus recipe. Deboned, flaked and re-stuffed with vegetables and spices! Baked or fried to golden crisp! 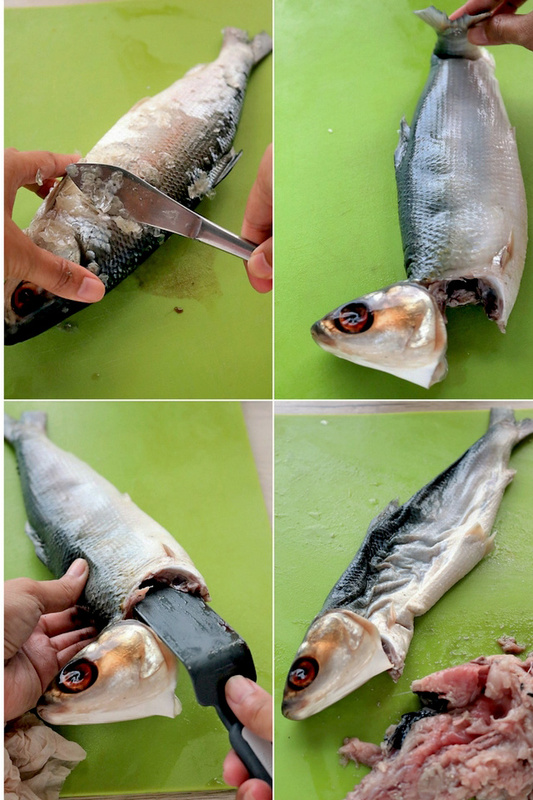 Prepare the milkfish as indicated in the instructions above. Place the fish skin on a plate or small bowl. Add 1 tablespoon of soy sauce and lemon or calamansi juice and marinade until ready to use. Place fish meat in a pot or pan and add a little water. Bring it to boil and cook until the meat is done. Drain water and transfer to a plate and remove the fishbones. Heat oil in a pan over medium heat. Saute garlic and onions until limp and aromatic. Add carrots and potatoes and cook for 3 minutes. Add the fish meat, bell pepper, raisins, pickle relish, soy sauce and tomato paste. Season with salt if needed. Cook for another 3-5 minutes. Remove pan from heat. Add the flour and mix then the egg and mix again until well blended. 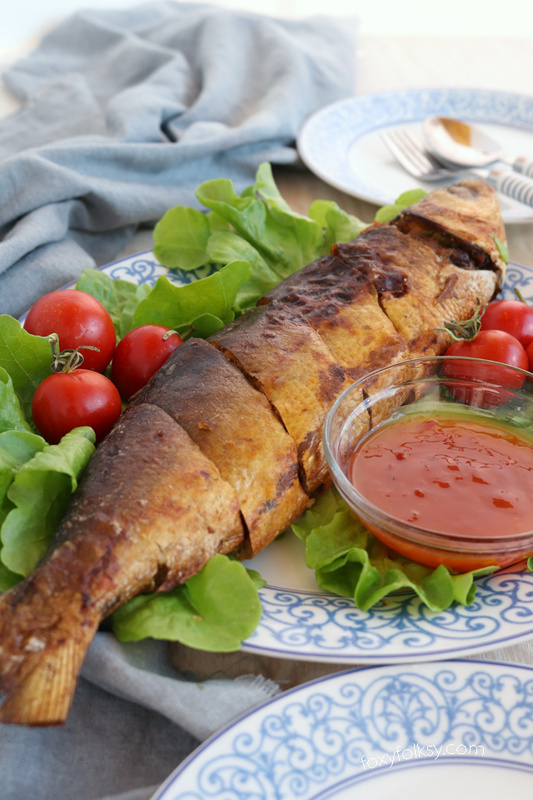 Fill the marinated skin with the mixture and then place the stuffed milkfish on a baking sheet lined with aluminum foil. Brush both sides with oil and bake at 180°C for 10-15 minutes each side or until skin turns crisp and golden brown. You may also fry the fish instead of baking it. hey bebs. love your milk fish. in indonesia we also have the same kind from this filled milk fish but in the different way. my grandpa village called it sate bandeng ( milk fish satay) also filled inside the milk fish body. but love the photo. 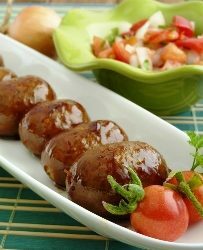 made me want to eat :D.
Hi Rike, interesting how some food around the world are different and similar at the same time. Thanks for the nice comment.? Can i ommit the tomato paste? Di Ba sya madaling mapanis pag may tomato paste? Thanks in answering.. If you will eat it within the day (or even 2) it should be fine. If not, just keep it stored in the fridge then it should be fine. Of course, you can skip the tomato paste/sauce entirely but I personally like the flavor it adds to the Relleno.